Bob Thompson, His Orchestra and Chorus: Just For Kicks / Mmm, Nice! / On the Rocks. Original albums released by RCA Records, 1958-1959. Deluxe 2-CD reissue with three bonus tracks released by Blue Moon Records (Spain), 2011. Available from Amazon.com (USA), Amazon.co.uk (UK), and Fresh Sound Records (EU). For more about Bob Thompson, visit the Official Bob Thompson Website. Bachelor Pad Music (also known as Space Age Pop or Space Age Bachelor Pad Music) is a multi-faceted collection of genres that represents, to quote the Music For a Bachelor’s Den (1995) compilation’s liner notes, “the type of easy listening music bachelors listened to, and entertained with, during the golden age of hi-fi and the dawn of stereo.” This umbrella title includes some of the most sensual as wwell as the and exciting and progressive music of the 1950’s and early 1960’s. Bachelor Pad Music often positions itself in those magical moments of initial interaction between the genders, and in an atmosphere of down-to-earth sophistication that has plenty of room for imagination and, most importantly, fun. This is the place where Bob Thompson’s classic albums Just For Kicks (1958), Mmm, Nice! (1959), and On the Rocks (1959) take us. With its subtle balance of sophisticated party music (think Henry Mancini), bouncy hi-fi stereo tester music (think Enoch Light), and Vintage television and movie music (think the Bewitched theme), with a dash of Exotica thrown in (think Martin Denny and Les Baxter), Just for Kicks, Mmm, Nice!, and On the Rocks work as some of the better examples of a “ground zero” Bachelor Pad Music sound and therefore are a good place to start exploring Bachelor Pad Music. Previously only available on CD as obscure Japanese imports, these albums are available together in the same package for the first time ever, thanks to a CD deluxe reissue from Spanish specialty label Blue Moon Producciones (aka Fresh Sound Records). This reissue goes out of its way to memorialize these albums, with expertly-designed deluxe foldout packaging augmented by a 16-page booklet that contains full session information, background info on Bob Thompson, and full front and back cover art for all three LP’s. The songs are arranged in the order in which they were recorded rather than according to the original track listings, but for the most part they transition well from one track to another. "Radio Theme In the Style of Bob Thompson", one of the bonus tracks on this CD reissue. This dreamy, nostagic-sounding track will likely be used as tag music for many a Bachleor Pad Music specialty radio show to come. This YouTube video features photos of Thompson in the studio, as well as the covers of two of the albums in this compilation. Bob Thompson is a Hollywood composer who was in demand in the 1950’s and 1960’s for his abilities as a TV and commercial music producer. Born in San Jose, California in 1924, Thompson discovered an old piano when he was a child and started trying to play it. This blossomed into his taking music lessons, which he continued to do through high school. In his college years at the University of California at Berkeley, Thompson became a fan of the radio. He interned at a radio station in San Francisco upon his graduation, and eventually was promoted to being a composer and arranger for the station’s on-staff band. He then went through a “wilderness period” working in Paris, going on the road, and finally settling in Los Angeles, initially working on demo tracks for songs that were pitched to major labels. The independent startup label Zephyr Records released two Bob Thompson 45’s, which then led to a record deal from RCA, who signed Thompson for a five-record deal. The reissue's liner notes also note that Bob Thompson “had a firm belief that the unexpected is exciting. If music is going to be fun—he reasoned—it ought to have surprises.” Thompson accomplishes this on these albums with an impeccable sense of balance and an over-the-top sense of fun that embodies the vibrant excitement that we tend to think of when the 1950’s comes to mind. The illustration on the back of Mmm, Nice! 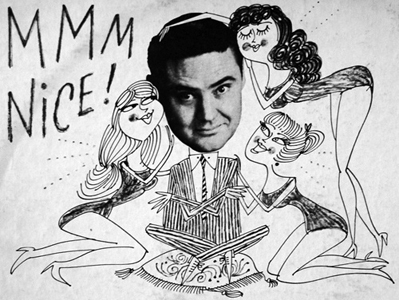 (1959), featuring a cartoon Bob Thompson surrounded by doting ladies. Courtesy of the Bob Thompson Website. The voices that make up the “chorus” sound like the down-to-earth vocals from 1950’s TV commercials, with purring and cooing from the gals added for spice and extra lady presence. The voices work partially as instrumental textures, and partially to ghost the lyrics of the songs that they are interpreting. Because current audiences already knew many the popular songs on these albums (e.g. “Makin’ Whoopee”, “Do It Again”, and “There’s a Small Hotel”), all the vocalists needed to do was provide points of melody so the listener’s mind could connect the dots. The chorus vocals usually start out sparingly, and then fill in the blanks more as the arrangement develops, until they eventually become the backing vocalists for a lead melody that is actually playing in the listener’s mind. Thompson also managed to negotiate the use of some of his own compositions for the albums. The Thompson originals are even more minimalistic lyrically, and tend to evoke the sense that a curvy, flirtatious woman or two are on the premises. This trend of a few Thompson originals on the album, with one of them serving as the title track, would hold for the duration of the series. From Bob Thompson's Just for Kicks (1958), here's the rollicking, bursting with joy and fun "On the Street Where You Live". This is the very first track on the two-CD set. Comprising of fourteen tracks, Just For Kicks, the first album in the series, is brimming over with who-knows-what-will-happen excitement and “the world is our playground” joie de vivre that sounds like a byproduct of the excitement Thompson must have felt in having his new opportunity to record for RCA. Just For Kicks was recorded over the course of four sessions in November 1958. Thompson had the privilege of cutting the album’s tracks at Radio Recorders, Hollywood’s premiere hi-fidelity recording studio. This busy and well-booked studio was far ahead of the curve in being able to capture a surprisingly lifelike sound. Any time that you listen to an album from the 1950’s that sounds particularly lifelike and full, with little to no distorted high end, chances are good it was recorded at Radio Recorders. Just For Kicks’ arrangements sound slightly rough around the edges, as though Thompson and Co. are familiarizing themselves with their hi-fidelity recording environment and a little unsure of what will happen. This lovable uncertainty is charming in and of itself, and adds a down-to-earth “human element” to his album. At the time of Just For Kicks’ recording, the Exotica sound was all the rage. Just For Kicks would borrow liberally from the genre, with the songs “Angel Eyes” and “Digga Digga Doo” in particular being Exotica in all but name. The Exotica sound would only be used as a subtle flourish on Mmm, Nice!, and would be completely absent on On The Rocks. The title track of Bob Thompson's Mmm, Nice! (1959). Just For Kicks’ follow-up, Mmm, Nice!, was recorded in June and August of 1959, again at Radio Recorders. Mmm, Nice is the best known and most widely available of all of Bob Thompson’s albums. It is also the album where the sound completely gels and achieves near musical perfection. Mmm, Nice! seems to understand and anticipate the flow of the human mind’s thought patterns, and plays them like a precision instrument. The album perfectly balances masculine and feminine appeal, foreground and background presence, and, most importantly, ghosting and singing the lyrics of the popular songs it interprets as described previously. The album knows exactly when the mind is ready for a little surprise, and delivers in full, superbly playing the old showbiz trick of giving an audience what they want plus one. For these reasons, we recommend that Mmm, Nice! be the first Bob Thompson album that you listen to. We also recommend that you listen to it in the album’s original track order to get the full effect. Of particular interest is the album’s cover, which features model, singer, and actress Sandy Warner. Sandy Warner is best known for appearing on fourteen Martin Denny LP covers, including the genre-defining Exotica (1957/1958); she also appeared as one of Sweet Sue’s Society Syncopators in the Marilyn Monroe film Some Like It Hot (1959) and in a couple of episodes of The Twilight Zone. The cover of Mmm, Nice! features Sandy in a modest black one-piece bathing suit, fishnet pantyhose, and red pumps, holding up the title of the album in one hand and the artist name in the other. If you look carefully at the cover, you will see that the photo of her is actually a colorized black and white photo. "June Is Bustin' Out All Over" from Bob Thompson's On the Rocks (1959). This song from the musical Carousel feels even more voluptuous when paired with On the Rocks' cheesecake-heavy album art. RCA seemed to think that they had a hit on their hands with Mmm, Nice! and did a large pressing of the album to meet the expected demand, only for the album to fail expectations and end up becoming a bargain bin filler. A disappointed RCA decided to scale back the budget for the third album, On The Rocks, by having Thompson and Co. record it in-house at RCA Victor Studios, also in Hollywood, in October and November of 1959. The sound quality suffered because of it, and this is immediately noticeable on the Blue Moon CD reissue. Although On the Rocks sounds like it’s lost a little of the wind in its sails, it still continues the joyous, bouncy sound of the first two albums. The album feels a little more reminiscent of the radio and TV advertisements of the time than does the first two (likely due in part to the sound quality), and has more of a tendency to play it safe and stay close to the previously-established formula. Regardless, On the Rocks grows on the listener when allowed to speak on its own terms and apart from the albums that preceded it. “Happy Talk,” “Breezin’ Along With the Breeze”, and “Just You, Just Me” are examples of songs that are a load of fun and grab the listener with repeated listens. RCA had signed Thompson for a run of five LP’s, but decided to end their contract after On The Rocks, which also had disappointing sales. Thompson was friends with Rosemary Clooney, who was also an RCA Victor artist, and RCA moved Thompson over to arranging for her. Clooney's first album with Thompson as director, Clap Hands! Here Comes Rosie! (1960), sounds like a followup album to On the Rocks, only with Clooney singing over top of it. Thompson’s work outside of his celebrated Bachelor Pad Music recordings included arranging for other artists, but the bulk of his work was in scoring commercial and advertising recordings, three of which are included as bonus tracks at the end of the second disc in this set. The instrumental “Radio Theme in the Style of Bob Thompson” is dreamy and nostalgic sounding, as is the bouncier instrumental “Texaco” theme. The final track, “Pepsi is For Swingers,” features crooner Mel Tormé on vocals and is actually the song "Everything's Coming Up Roses" with different lyrics. (Thompson also arranged and conducted this song with the original lyrics on the aforementioned Rosemary Clooney album Clap Hands! Here Comes Rosie!) If you enjoy the Sinatra side of the Rat Pack sound, "Pepsi is For Swingers" is a well done jingle within that style. Thompson would release two more albums after this run of albums on RCA. The first was the concept album The Sound of Speed (Dot, 1960), and the second was the ultra-rare industrial musical That Agency Thing (private pressing, 1963). 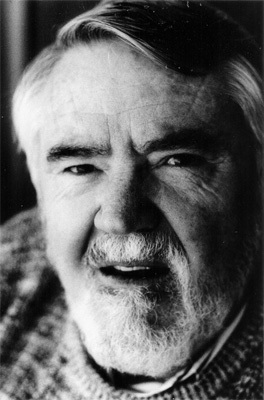 A photo of Bob Thompson later in life, courtesy of the Bob Thompson Website. Bob Thompson’s albums started to be rediscovered in the 1980’s, and were then critically reassessed in the 1990’s when Bachelor Pad Music had a full-on revival of interest. Thompson’s son Spenser Thompson launched a Bob Thompson website in the late 1990’s that has been an Internet staple for those researching Bachelor Pad Music; it is filled in many otherwise unavailable details on Thompson’s life story and the music he created. Thompson’s son’s devotion to retelling his father's story, plus the accidental abundance of LP copies of Mmm, Nice! left over from its initial overpressing, are two happy accidents that have made Thompson one of the better-remembered Bachelor Pad Music artists in a genre that he contributed to relatively sparingly. Big thanks to Blue Moon Producciones for giving these albums the royal treatment they deserve, and for making these classic bachelor pad albums available to a wider audience. This is a foundational set for Bachelor Pad Music fans, as well as fantastic music for parties, and great music to work, study, and relax to.